The continuous development of the ID. R is in full swing. The prototype, powered by two electric motors with a 671bhp system performance, will in summer 2019 hunt down the lap record for electric vehicles on the Nurburgring-Nordschleife with Romain Dumas at the wheel. A focus of the structure simulation is to calculate the loads on the chassis, suspension and bodywork of the ID. 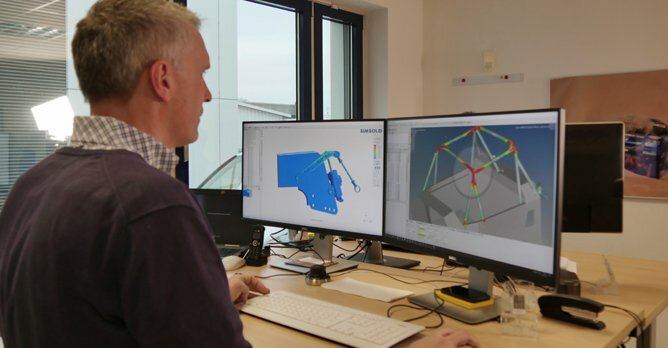 R As well as extensive test drives and the work in the wind tunnel, Volkswagen Motorsport is also strongly relying on computer simulations in the preparation phase. These digital tools not only represent essential support for the engineers, they also save time and costs. "While Romain Dumas practices the track or tests various chassis set-ups on the driving simulator, simulation technology also plays a crucial role for the engineers as well," explains Dr. Benjamin Ahrenholz, Head of Calculation/Simulation at Volkswagen Motorsport. "With regard to the Nurburgring-Nordschleife, we are in the fortunate position of being in possession of a wealth of data on the track layout and road surface. This allows us to adapt the ID. R virtually as efficiently as possible, despite the fact it has never driven a lap of the Nordschleife before." Whatever Romain Dumas inputs through the virtual cockpit - technically known as 'Driver in the Loop' - the computer then builds upon in the offline driving dynamics simulation, whereby it completes, theoretically, an infinite number of laps with a saved profile. In this way, the simulations can determine how different power outputs of the motors or shifts in the vehicle's centre of gravity affect the ultimate lap time. This is all with the aim of optimising the handling of the car and the responsiveness of the motors.